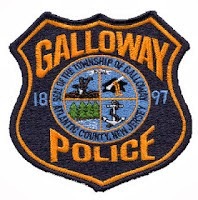 Galloway Township Police responded to 815 calls for service during January 5, 2014 through January 11, 2014. Additional statistics include: 2 Burglaries, 20 Motor Vehicle Accidents, 55 Tickets issued, 2 Driving While Intoxicated, 16 Arrests, 12 Domestic Violence, 27 Fire Calls, 94 EMS Calls and 1 Juvenile call. Rosalita Parker, 24, of Little Egg Harbor was arrested by Ofc. Vincent Ceci for possession of CDS and possession of a hypodermic needle on January 5. Yissel A. Genao, 37, of Northfield was arrested by Ofc. Dan Weigle for DWI on January 5. Katherine P. LLerena-Uchillan, 23, of Galloway was arrested by Ofc. Tom Guercioni for DWI on January 5. Eli Timberlake, 47, of Hamilton Twp. was arrested by Ofc. Pat Neal for possession of less than 50 grams of marijuana on January 10. Melissa M. Sherrer, 21, of Pleasantville was arrested by Ofc. Steve Vernon for burglary and criminal mischief on January 11. A 14 year old male of Galloway was charged on January 10, 2014 by Ofc. Justin Butler for improper behavior.